A term used frequently in astronomy that measures brightness in space is “magnitude.” So what the heck is it and how can you understand it more clearly? I hope this short writing will begin to clear things up a bit. For starters, in astronomy there are three main categories of magnitude: APPARENT MAGNITUDE, ABSOLUTE MAGNITUDE and INTEGRATED MAGNITUDE. There’s also BOLOMETRIC MAGNITUDE as well as PHOTOGRAPHIC MAGNITUDE but I’m not going into depth with these. We will touch on the first two in detail but as for integrated magnitude, that can get fairly complex and mathy (my own word, I love it, sorry not sorry). So in order to save headaches (mine) I’ll just mention it briefly. Perhaps in the future I’ll dedicate an entire page to it if enough of you show an interest in learning more about it. 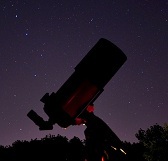 Overview: In astronomy, magnitudes are a tool to help you gauge how bright an object is. The magnitude system works like golf or a pitchers ERA, where the lower the number, the brighter the object is. For example, the Sun is a blinding apparent magnitude of -26.8 while the planet Neptune is a very dim apparent magnitude of +7.8. When using positive (dim) magnitudes you don’t need to use the “+” (plus). For example I could have said Neptune is an apparent magnitude of 7.8 instead of +7.8. In fact that’s how you will usually see apparent magnitudes displayed. You do however, have to use the “-“(minus) symbol for negative (brighter) numbers. So remember, the brighter an object is, the lower the apparent magnitude number will be, while dim objects are represented by bigger numbers. Apparent Magnitude (m): When you look into the night sky with wonder, one aspect of that you may or may not consider is “How bright are these objects that I see nightly?” Apparent magnitude is the most widely used form of magnitude used in astronomy as it tells you how bright an object is on the sky as you see it from vantage point Earth. This doesn’t help you compare how bright celestial objects are in comparison to each other in reality, but only as you see them from the ground. I like to call it “real time” brightness. Using apparent magnitude; the brightest star in the night sky is Sirius at an (m) of -1.47 (“m” represents apparent magnitude while “M” represents absolute magnitude). The magnitude scale was invented in around 150 B.C. by Greek astronomer Hipparchus (though some reference Ptolemy). He ran the scale by a simple 1 through 6 with 1 being the brightest objects and 6 being the faintest. The problem with that is, many of the brightest stars were classified as 0 (zero) and they didn’t necessarily start with the brightest stars. Also, with no telescope he could only see stars to around 6th magnitude. We can see much dimmer objects with today’s equipment. When telescopes in the early 1600’s discovered fainter stars astronomy modernized the scale it took those bright zero stars and gave them negative numbers and thus, the scale was expanded. The human eye detects differences in light logarithmically and that’s also how the magnitude scale is formatted. Each magnitude is approximately 2.5 times brighter or dimmer than the next depending on which direction you’re going. Thus a magnitude of 1 is 100 times brighter than a magnitude of 6. Remember were talking magnitudes here so an object with a (m) of 1 is 2.5 times brighter than a (m) 2 object but 6.3 times brighter than a (m) 3 object, 15.9 times brighter than a (m) 4 object, 39.8 times brighter than a (m) 5 object, 100 times brighter than a (m) 6 object, 244 times brighter than a (m) 7 object etc. etc. Absolute Magnitude (M): This aspect to magnitudes can get a little tricky but the theory behind it should be easy to understand. Absolute magnitude was created so astronomers could have a way to determine how bright (intrinsically bright) celestial objects are in comparison to other celestial objects. To do that, the formula is to take every object in the night sky that you want to measure the brightness of, and place them all 10 parsecs (32.616 light years) away. Now that they are equal distances from you, their brightness can be compared. For example….let’s say you have two cars of the same make and model, one is a half mile away and the other is four miles away with its high beams on. At four miles those headlights are still much dimmer than the near vehicle. So how would you go about figuring out which car has its high beams on? Apparent magnitude wouldn’t work because all you would be doing is recording the brightness as you see them in the positions they’re currently in. In the spirit of absolute magnitude, you take both vehicles and place them the same distance apart, say, a quarter of a mile. Now it’s much easier to compare the brightness of the two vehicles and determine which has its high beams on. That’s absolute magnitude. Another example: As I stated above, the Sun is an apparent magnitude (brightness as you see it on the sky) -26.8 but if we wanted to measure it against another star we have to take it out of its 8 light minute distance from us and place it out to 10 parsecs or 32.616 light years away. Obviously this is going to change things because the Suns magnitude has gone from an apparent magnitude of -26.8 to an absolute magnitude of 4.75 or if you prefer +4.75 which would be just visible to the naked eye. Another way to attempt to envision this example is, using apparent magnitude (real time brightness), the Sun is about 8 light minutes or 1 AU distant. To use absolute magnitude, that 10 parsecs equates to a 2,062,627 AU distance. The brightest star known is the Pistol Star at an (M) of -14.2 which at that distance is incredibly bright. INTEGRATED MAGNITUDE: As I said, I’m just going to touch this lightly so you have an idea as to what it is. This is for objects like nebulae, clusters or galaxies whose light doesn’t come in a point source but instead the light is delivered via the objects surface brightness. Integrated magnitude calculates that surface brightness and delivers it “as if” it were a point source. Example: If you are observing a galaxy, the catalog may say that it’s a magnitude of 5 but when you look for it you soon realize that the galaxy is nowhere near as bright as a magnitude 5 star. What you read was likely the object’s integrated magnitude because they took that galaxies surface brightness and calculated what it would be if all the visible light that it radiates were contracted into a star-like point. -26.8 = Sun which is 400,000 times brighter than the full moon. -9.5 = Maximum brightness of an Iridium Flare. -6.5 = Ahad’s Constant (See definition below). -5.9 = ISS at its brightest pass. -4.9 = Maximum brightness of Venus, the brightest planet. -4.0 = Faintest objects observable in daylight with naked eye. -2.9 = Maximum brightness of Jupiter & Mars (While at opposition). -1.47 = Brightest star Sirius (Canis Majoris) and one of the 3 Winter Triangle asterism stars. -0.72 = Second brightest star Canopus. -0.49 = Maximum brightness of Saturn (While at opposition and with rings fully open). -0.27 = Third brightest star Alpha Centauri. -0.04 = Fourth brightest star Arcturus (Bootes). +0.03 = Star Vega (Lyra) (This star was originally the 0.00 point). 0.12 = Star Rigel (Orion). 0.38 = Star Procyon (Canis Minoris) and one of the 3 Winter Triangle asterism stars. 0.50 = Star Betelgeuse (Orion) and one of the 3 Winter Triangle asterism stars. 0.77 = Star Altair (Aquila). 0.85 = Star Aldebaran (Taurus). 0.96 = Star Antares (Scorpius). 1.04 = Star Spica (Virgo). 1.14 = Star Pollux (Gemini). 1.35 = Star Regulus (Leo). 1.58 = Star Castor (Gemini). 1.6 = Magnitude of stars in M45 Pleiades star cluster (Taurus). 3.9 = Omega Centauri globular cluster (Centaurus). 4.38 = Ganymede, Jupiter’s moon and largest moon in the solar system. 5.1 = Max brightness of Asteroid Vesta at opposition. 5.72 = Spiral Galaxy M33, the Triangulum Galaxy as well as max brightness of Uranus during opposition. 6.5 = Max brightness of Dwarf Planet Ceres at opposition. 6.90 = Spiral Galaxy M81 Bode’s Galaxy. One of the most-dim naked eye objects visible under perfectly dark, Class 1 Bortle Dark-Sky Scale conditions. This is about the limits of seeing for the human eye without aid (binoculars, telescope etc.). 7.8 = Max brightness of Neptune (At opposition). 8.8 = M57 Ring Nebula. 10.0 = Binocular limit (estimate). 12.0 = Approximate faintest stars visible in a 6-inch telescope. 13.0 = Approximate faintest stars visible in an 8-inch telescope. 14.0 = Approximate faintest stars visible in a 10-inch telescope. Fun Fact: Ahdad’s Constant is the total integrated brightness of the universe, minus the Sun from our vantage point here on Earth. All of the galaxies, stars and nebula concentrated reach a magnitude of -6.5. That’s 1/300 the light of a Full Moon. Scientist Abdul Ahad created this formula in 2004. “This is the weight of the universe’s stare upon the Earth.” – Abdul Ahad.